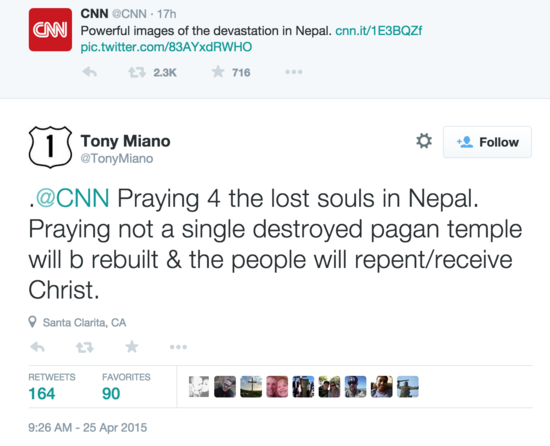 For God so loves the world he let an earthquake and its many aftershocks kill up to 10,000 people in Nepal. For God so loves the world he stood by while up 100,000 more people lost everything, including their homes, because of the same earthquake. For God so loves the world he drowned 900 refugees fleeing the terrors of war in their own countries. For God so loves the world he allowed 250 individuals to be killed by a rogue pilot who flew the plane they were on into the side of a mountain. And, do you know, they’re right. No, really, they are. There is no other response available to the Christian who wants to explain events that involve the terrible loss of life. That’s because the Christian God, the one who purports to love us so much, as well as all the other versions, is conspicuous by his absence. He’s always absent, always powerless to prevent such disasters, too remote to want to. Which might just suggest he doesn’t exist (which of course he doesn’t) leaving those who feel the need to cling to belief in him to explain his actions or, rather, the lack of them. So they supply him with an ulterior motive. And why not? A fabricated being needs a fabricated excuse. But this being the real world, the options are limited. So what we get is this; God is only trying to draw people to him. How truly loving. The equivalent of a human father murdering several of his children so that those he spares might love him more. A monstrous and preposterous idea for a monstrous and preposterous God. And so it falls to human beings of all persuasions to show compassion and to help the survivors of earthquakes, the relatives of plane crashes, the misplaced and grieving refugees. We might be flawed, fallible and – according to the self-righteous – ‘sinful’, but we can at our best, demonstrate the love so lacking in their absent deities. And unlike the many meaningless gods, from Yahweh and Jesus to Allah and Vishnu, we can be present too, because we are real. 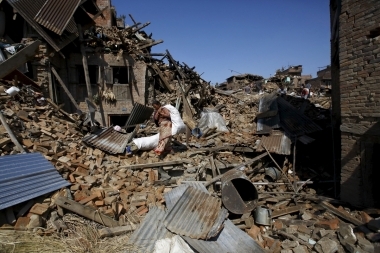 You can donate to the Nepal earthquake appeal here. This entry was posted in 'Proof' of God, Christian extremists, Christian failure, Christianity's failure to deliver, Christians are humanists too, Extremism, In God's name, The impossibility of faith and tagged Atheism, Christian love, Christianity, faith, God, God's love, Morality, Tony Miano, Wolfgang Wegert by Neil. Bookmark the permalink. Even as those upon whom the the tower of Siloam fell we can expect such”judgements”except we repent,but we may get them anyway since god makes his rain “to fall on the evil and the good” anyway. How convenient and sweet it all is for this double tongued “single-minded” god.It’s like we are to be his good hands extended after he does evil or maybe just after what he let his son the devil do. Yes, but we mustn’t forget – despite my writing here as if he does – that he doesn’t exist; his inconsistencies are the result of his being created by numerous different hands and voices over thousands of years. To a large degree this fictional God is a reflection of an indifferent and often cruel universe; ancient tribemen’s way of explaining the unpleasant things that happened to them. The unpleasant still happens of course, but we now know it’s not the result of a capricious God, despite what the religious still like to tell us.